Roller Boogie is the film that asks: can a classical flautist and a roller skating dude find true love and happiness in the California sun while boogying on skates to 70’s disco tunes? Roller Boogie stars Linda Blair (The Exorcist) as Terry Barkley, a genius flautist (and Juilliard hopeful) and Jim Bray (real life roller skating phenomenon) as Bobby James, a maniac on skates with all the right moves and his sights set on becoming an Olympic Roller Skater. Starting with a traditional cinematic “meet cute” scene (Bobby saves Terry from a skating accident at the local roller rink), Roller Boogie is kicked into high gear when a ruthless mobster plans to buy Jammers, the local roller rink, for nefarious reasons. Will Terry give up on her dreams of playing classical flute at Juilliard to team up with Bobby and enter the Jammer’s roller disco contest? Will Bobby see his Olympic skating dreams come true? Will the mobster really buy Jammers? Where’s the parental supervision? 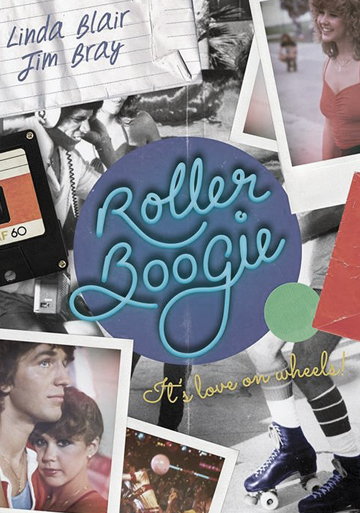 Roller Boogie, with its amazing choreography and on-the-skate-floor acrobatics, is directed by Mark L. Lester (Class of 1984), from a screenplay by Barry Schneider, features a soundtrack stuffed with disco tunes including Hell On Wheels performed by Cher, The Roller Boogie written by Mavis & Bob Esty, Boogie Wonderland written by Jon Lind and Allee Willis and the Bob Esty & Michael Brooks song Summer Love. Linda Blair stops being possessed and get's rolling!